Starting up your wood stove or fireplace can add warmth to your family's home. Know the safety measures you need to take to as the winter season begins. 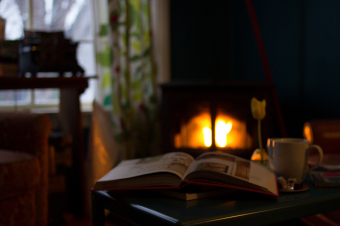 On a cold winter evening, curling up with your family members next to a cozy fire can be a real source of pleasure. A wood stove or fireplace in your house can also supplement your home’s heating systems. There are certain risks that come with having open flames in your home. Following a few basic safety tips for your wood stove or fireplace will help to reduce the risks this winter season. They say that ‘an ounce of prevention is worth a pound of cure’. This is especially true when it comes to a wood stove or fireplace in the home. Store the wood for your stove or fireplace at a safe distance to reduce fire risks. Check with your local fire department or your wood stove manual for proper clearances. The St. Thomas municipal website and London Fire Department website have guiding fire safety information for local homeowners. Your fire department, building inspector, stove retailer or chimney sweep can conduct an initial inspection on your wood stove or fireplace to ensure that it meets Wood Energy Technology Transfer (WETT) safety guidelines. Servicers who work on your unit must be WETT certified to perform any ongoing work on your unit. Inspections for London-area homeowners can be booked with Elmira Stove Works or MyFireplace. Your chimney must be cleaned twice a year to avoid creosote buildup. Creosote is a highly combustible fuel that burns intensely (Napoleon Fireplaces, 2015). Your typical wood stove fire is slow-burning. This does not generate enough energy to carry out all unburned, combustible gases. Instead, these gases condense along the walls of the stovepipe and chimney as creosote. This can take the form of a sticky liquid. It might also be a flaky, black deposit which can be removed using a wire brush. When creosote becomes a hard, glazed tar, only a certified professional chimney sweep can remove it. Inspect your flue vents often and avoid building cardboard, trash, or green wood to reduce the potential for creosote buildup. Equipping your home with the proper safety gear is a smart move. Keep a Class A fire extinguisher near your wood stove or fireplace. Make sure that smoke alarms and carbon monoxide detectors are installed and tested in the home’s living space. Your wood-burning appliance should never use an unlined, single brick chimney. Single brick chimneys are prone to deterioration. This reduces the safety of the unit. The venting system for your wood stove or fireplace includes 24-gauge or heavier insulated stovepipe which connects the stove to an approved chimney. Stovepipe clearance should never pass through an interior wall, floor, or ceiling. Most stove-related fires originate within the venting system, making this a critical safety feature. Reducing risk in your home by properly inspecting and maintaining your wood stove or fireplace will help keep your family safe and comfortable during the winter season. If you are not sure what your home insurance covers, we invite you to talk to one of our insurance brokers today to review your home insurance policy.